MESO is a “science center on wheels” to engage and excite students, teachers, and local residents with hands-on educational and research activities focused on earth and space sciences, renewable energy, and scientific instrumentation. MESO deploys to schools and community sites for a full day or for a few weeks. Deployments include in-depth programming in classrooms, scientific instrumentation usage at the MESO vehicle, and day & evening solar/star viewing. 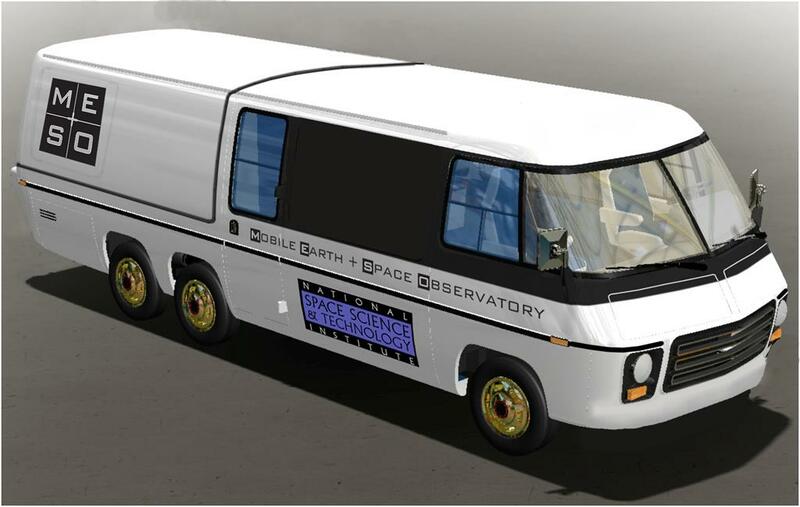 This "Science Center on Wheels” gives students a realistic exposure of the STEM (Science, Technology, Engineering and Math) pathway, and what it means to be a scientist. MESO participants explore the process of science, and in-depth scientific concepts such as: Light - looking through infrared cameras, solar telescopes, experiencing the phenomena of spectroscopy. Experiences can expand into classroom activities, with scientific content specific to 1) Environmental Literacy and the Importance of Water, 2) The search for Life in the Universe with authentic scientific research, and/or the 3) Sun - Earth connection. Programming is inquiry based, developed by professional educators, vetted by PhD scientists, and delivered in an interactive, hands on, fun experience! This program focuses on using MESO as a resource to teach students about environmental science and climate change and to promote environmental stewardship and community resiliency to weather and climate events. We have been awarded a grant from the Environmental Protection Agency (EPA) to support this program that focuses specifically on hydrological systems and community response to changes in precipitation, including floods and droughts. In this program students collect and analyze data on planetary transits using MESO’s proposed 14-inch optical astronomical telescope. The telescope can operate in either an interactive or a robotic mode so students can have both the tangible experience of looking through it and the research experience of programming it to take data while they sleep. We will leverage the power of inquiry-based learning and of the intrinsic draw of the subject matter, namely the search for life in the universe, to address core science curriculum and to inspire students to pursue STEM careers. This is our Here Comes the Sun program that focuses on the Sun and its impact on the Earth. Heliophysics lies at a unique crossroads between the inspirational wonder of astronomy and science in the service of society. As such, we will emphasize both the Sun as a star, placing the Sun and solar system within a universal context, and space weather, exploring how the Sun powers Earth’s climate system and how activity on the surface of the sun poses potential hazards to our technological society. Help us achieve our vision, donate to the MESO. Please designate 'MESO' when making a contribution to the National Space Science & Technology Institute. Copyright © 1997 - 2019, National Space Science & Technology Institute. All rights reserved.